Hello, it's been a while (a long while) since I've updated what's going on with my projects. I'm going to be posting more regularly. I think that writing out what I'm doing may help me to think more clearly about what I'm doing. So, the current big project is an embroidered vest. The theme for it is "Ripples" and I'm using couched gold threads for the actual ripples, which I think will give a flat, more reflective area on the vest. 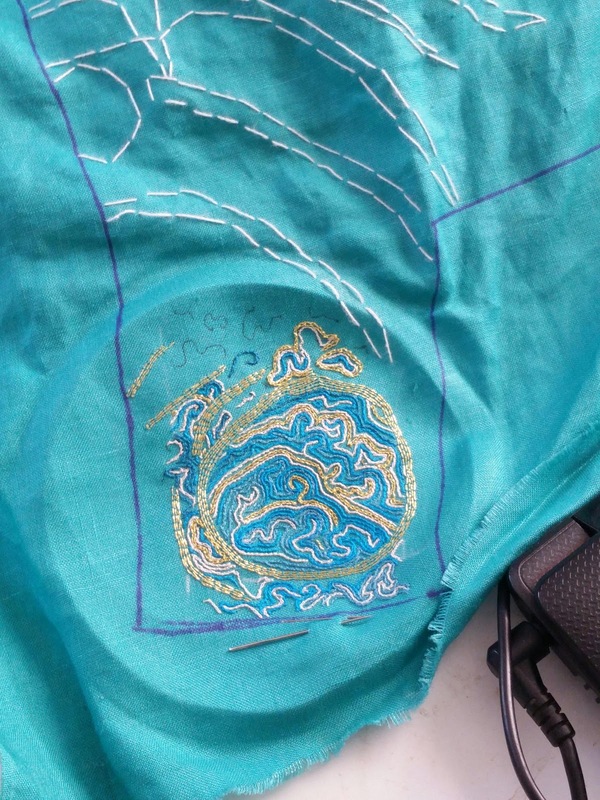 Around that I'm doing a kind of marbelized effect, with chain, split and outline stitch. This is the first of three panels (left, right and back) when this layer is done, I may be adding 3 dimensional fish, or leaves and flowers, I'm not sure yet.